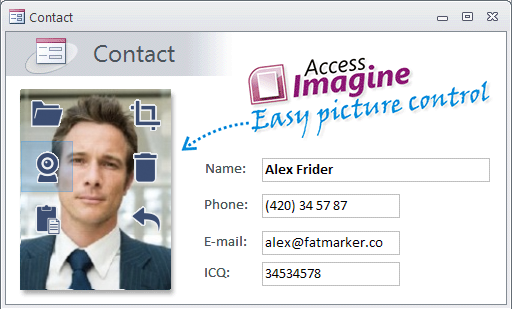 AccessImagine is simple and powerful solution. This ActiveX will be the real gem of your DB. It’s easy to insert images into DB – from file, webcam, clipboard or drag-n-drop. Crop images right on form! No need to VBA in most cases. Just place the control on form and bind it to picture field. Automatic downsample, external storage and JPEG compression. AccessImagine is one of the most productive tools I’ve found in a long time. It saved hours of work and is so simple to use that it makes the average Access user a power user instantly when the goal is to insert images! This is a great control and makes my life much easier! I have tried the camera functionality and it works like a miracle. Why not try it in 2 minutes?